Casual elegance and spacious comfort set within lush tropical gardens at this 200 room resort. 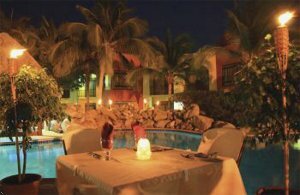 Two pools-tennis courts-poolside Salsa Bar featuring daily happy hours and entertainment. The Garden Cafe Restaurant. Health Spa-beach access across the street with free beach shuttle provided and within walking distance of many Palm Beach Hotels and casinos. AUA- Reina Beatrix Airport- 10 mi NW From Reina Beatrix Airport - AUA - Drive west onto J.E. Yrausquin Boulevard. Through town. Follow signs to Palm Beach high-rise hotels. Turn left at the entrance of Windmill Restaurant.